Simple: Floors For paws. Officially the Worlds best flooring for dogs & dog owners. 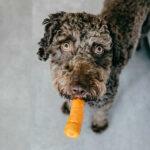 Over the last 20 years Dog owners have discovered the limitations of many different flooring types for dogs; carpet, laminate, wood and tile. Each of which has limitations; either impossible to maintain, slippery, or non-resistant to scratches. With the introduction of Luxury Vinyl dog owners and indeed dogs exclaimed a cry of ‘halleluiah’ Here was something that offered us a solution. Waterproof, stain resistant and hard wearing. Imagine taking that solution and making it even better! 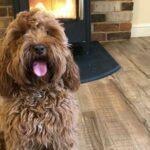 With the introduction of a double wear layer and a slip rating of 85 PTV Floors For Paws can now offer dogs and dog owners a flooring that is Scratch resistant, water proof, stain resistant, anti-slip and with the advancements in printing technology a flooring that has the look, warmth and feel of natural products. Floors For Paws: The best flooring for dogs. Tested by dogs for dogs. Run by Dog lovers for Dog lovers. Wherever your dog goes; go Floors for Paws. ORDER YOUR FREE FLOORING SAMPLES TODAY!